[SatNews] The partnership between Astrium and JSC NC Kazakhstan Gharysh Sapary (KGS), the national company charged with the development of Kazakhstan’s space program, has reached another major milestone with the signature of a contract for a Satellite Assembly, Integration and Test (AIT) Centre in Astana. Astrium and KGS signed the agreement, under which Astrium will provide and install the various test equipment (mechanical, radiometric, thermal and acoustic facilities) at the new AIT Centre. Astrium will also assist KGS in the construction of the AIT Centre to ensure coordination with the test equipment. This follows a major contract signed in October 2009 by Astrium and KGS for the development of two Earth observation satellites. The AIT Centre will form part of the ‘Space City’ that the Kazakhstan space agency, Kazcosmos, is developing in Astana. The city will also include the ground segment for the two Astrium-built satellites, as well an administrative building and a museum dedicated to the country’s long space history. A Joint Venture signed between KGS and Astrium in October 2009 to jointly manage the Astana AIT Centre and implement Kazakhstan’s future satellite programs will now become operational. Kazakhstan has been involved in spaceflight since the very beginning. In 1957, the Soviet Union chose Baikonur as the launch site for the first satellite, the legendary Sputnik 1. Then, in 1961, the world’s first astronaut, Yuri Gagarin, took off from Baikonur. Baikonur is still Russia’s primary launch site under lease from the Republic of Kazakhstan. Since the early space age, all the human Soyouz flights to the Space Stations have taken off from Baikonur. Kazakhstan is now developing new ambitions in space as part of the program A New Kazakhstan in a New World. One of the goals of this program — launched ten years ago — is to provide the country with the most advanced technology and to develop Kazakhstan’s own industrial expertise. 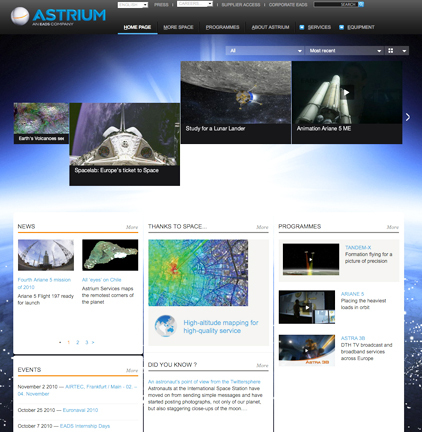 Astrium, the European leader in space technology, is offering Kazakhstan its know-how via a strategic and technological partnership that will help the country fulfil its space ambitions.